This article first appeared in The Edge Financial Daily, on October 27, 2016. Maintain neutral with an unchanged target price (TP) of RM3.41: UEM Edgenta Bhd was awarded a contract for the provision of operation and maintenance of Central Utilities Facilities for Biotechnology Park at Iskandar Puteri, Johor. The RM16.3 million contract will be for a period of 24 months starting from Monday until Oct 23, 2018. The contract was awarded by Malaysian Bio-Xcell Sdn Bhd which is a 60:40 joint-venture (JV) company between Biotech Corp Investment Holdings Sdn Bhd and UEM Sunrise Bhd. The contract award is not unexpected as, under a separate JV between UEM Edgenta and UEM Sunrise, UEM Edgenta was given a first right of refusal to undertake the provision of property and township management services for projects under UEM Sunrise in Johor. However, we are “neutral on” the contract awarded as it will only contribute less than 1% in the earnings to UEM Edgenta in the financial year 2016 (FY16) to FY17. That said, we expect more contracts to be awarded to UEM Edgenta in the future under this JV. After incorporating the new contract amount into our forecasts, our FY16 to FY17 earnings have been lifted marginally by 0.08% and 0.3% respectively. 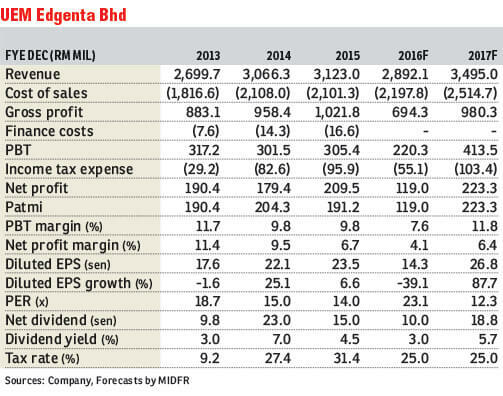 We are maintaining our “neutral” call with an unchanged sum-of-parts-based TP of RM3.41 on UEM Edgenta, post-earnings revision. We reiterate that we remain wary on the challenging operating environment faced by its main revenue contributor, Opus Group. That said, it continues to possess a robust balance sheet position which we opine will enable it to be more flexible in terms of engaging in potential new opportunities such as acquisitions that could assist in contributing to its revenue.